Composite decking is increasingly becoming a very popular decking material choice in Calgary. There was a time when wood was the most widely-used material for these outdoor features. However, there has been a distinct shift in this trend over the past few years. Today, a lot of people are opting for the beauty and durability of composite decks. Designed to deliver outstanding aesthetics, amazing durability and easy maintenance, composite decking in Calgary offers all the beauty of timber without any of the hassles associated with its continuous upkeep. The simple fact is that modern-day homeowners prefer to spend their time enjoying leisurely moments in their outdoor living areas, rather than slaving away on weekends, on their maintenance. Top quality composite decking materials are able to stand up very well to regular wear and tear and exposure to the elements far better than wooden decking. It’s also made from recycled materials, which makes it one of the top choices for eco-conscious customers. 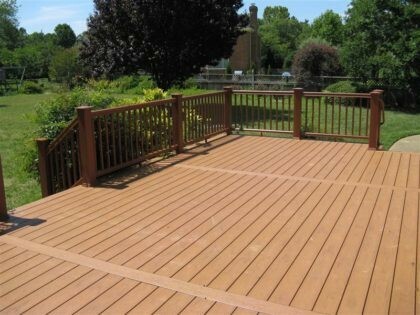 Durable– As mentioned earlier, composite decks are extremely durable. They resist mold, scratches, staining, and Aside from this, they don’t warp, crack or rot and are splinter-free and insect-proof too. These qualities make them a much more comfortable and safe option for families with children and pets. Sustainable– Composite decking in Calgary emulates the look of wood without any of the related environmental impact. These boards are made of recycled materials which include recycled plastics from materials such as newspaper sleeves & shopping bags as well as wood scraps. Low-Maintenance– When you opt for a composite deck, you never have to worry about aspects such as annual sanding, painting or staining. All it needs is a soap and water cleaning every once in a while. This will keep it looking new and in a good condition for a number of years. Some of the top composite decking brands offer a 25-year stain and fade warranty too which are definite advantages. In addition, composite decking in Calgary is available in saturated colors and in very rich wood grain patterns, which gives it a very natural look and feel. You can choose from earthy tones, pristine greys and spicy reds. You all can also opt for composite accessories including gates, stairs and railings etc. When you take all these benefits into account, you realize that composite decking truly provides excellent value for money. For any more information feel free to call Project Landscape at 403-407-5777 or drop us a line via this Online Form. We are Calgary landscaping experts.